The word '仁' (ren) is only used eighteen times within Li Ren, all used within the first seven of the twenty-six quotes, and all relate to an individual's own inner qualities, while not relating to an individual's outward behavior, nor relating to a village, neighborhood, or nation. The one and only use of '里仁' within the book is at the first of the first quote '里仁為美', which implies something close to 'inner benevolence be beautiful'. The one and only use of '里' within the book is at the first of the first quote. All quotes within 里仁 relate to one's own inner qualities, while none focus upon 'benevolence' being solely a visibly observed external measure. The Chinese word 里 typically implies 'in, inner, inside, interior, internal, li (measure of a Chinese mile, about 500 yards), neighborhood, village'. Li itself is composed of two symbols, 'farm (the upper square)' and 'earth (the lower cross)'. 仁 (ren) typically implies 'benevolence, compassion, humane, kind'. 仁 itself is composed of two symbols, '亻 (people, person)' and '二 (two, second, again, etc. )', which might imply 'behavior and feelings between two people together'. Since it is only possible to outwardly express the commonly interpreted behaviors of 'benevolence' and 'compassion' when there is a second individual or thing to express the behavior to, then 仁 could also possibly point to something like 'one person amidst two'. It is reported that Asian philosophers are still debating the meaning of ren, and so, since no western philosopher knows what the English word 'benevolence' means either, then whatsoever definitions that might exist in English dictionaries, are certain to not be final, nor truly valid. Nevertheless, the general idea of Li Ren is 'inner benevolence', relating to a good person's inner qualities that are expressed outwardly. The title of Li Ren does not appear to have often been given an English interpretation itself, with the only known publicly available title translation being 'Neighborhood Benevolence'. However, since 'benevolence' is an undefined unknown in English, and since 'benevolence' is itself best used with the conceptualization of external behaviors, then it is favored to offer a more accurate English term of what 'benevolence' might imply internally. If the measure of 'benevolence' is an outward effect, then the inward cause is different. Individuals who can self-observe, and self-think, are aware of the inner 'acts' that occur prior to and during the outer behavior of 'benevolence'. And so, within the effort of descriptive accuracy while still retaining brevity, inner 仁 has been given the English metaphorical word of tone, which points to one's own inner self's 'active inward source of outward radiance'. 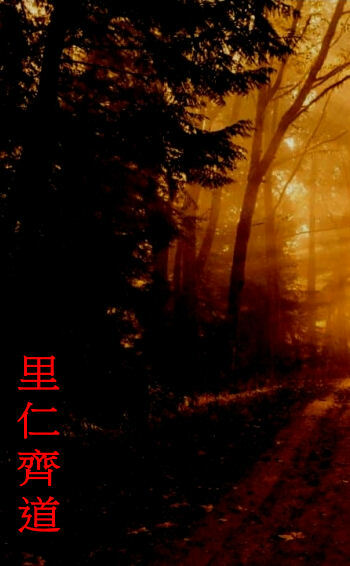 Therefore, for the title, 里仁齊道, Li Ren Chi Dao, implies 'Inner Tone Harmony Way', which also points to the translation's English wording being harmonious with the original intents of the ancient Chinese text. Of the twenty individual books within the Confucian collection titled The Analects, the fourth book is titled 里仁 Li Ren. Li Ren is a fairly short book of twenty-six quotes, with most of the quotes only being of one to a few sentences each. Li Ren is relatively easy to translate, perhaps, mostly, because Li Ren's topics are related to good things... good things that are appreciative of being found within written words. The Analects provides a sizable background of the cultures within the ancient Chinese regions. Most valuable are the quotes attributed to Confucius, which give a good idea of how Confucianism was born, and also lend an idea of how Confucianism influenced Asia. Although the ancient Chinese script was transcribed into modern Chinese script, still there is sizable confidence that the modern script adequately conveys most of the original words' intents. The most difficult nature of The Analects is the Chinese language itself. Unlike English and related European languages that only have words that are defined by how they are memorized, spoken in sentences, and defined within dictionaries, the ancient Chinese language's characters are of ideogram symbolisms that are placed together to create a concept that relates to real life, and must be interpreted relative to one's own personal life. Due to it being impossible for any two individuals to share the same identical thoughts and life histories, then it is also impossible for any two translators to interpret the ancient Chinese words identically the same. As an example, where an ancient Chinese word can imply several different degrees of an emotion or behavior, the common English translations almost always choose the most violent and negative of English words. One ancient Chinese word is written to imply 'self-embarrassment' or 'hurt feelings', but common English translations choose words like 'humiliation', 'disgrace', and 'shame'. A different word can imply a positive thing like 'intelligent fairness of thought and behavior', but common English translations almost always choose physical 'punishment', 'penalty' and 'execution'. All English translations are a mirror of the translators' own lives, the translators' own histories, the translators' own firsthand experience with the topics, the translators' own hearts, and the translators' own mental stability. English translations that predominately choose English words of violence, cruelty, and contradictions, amply illustrate that the translators themselves are similar. The common translations of The Analects are indeed presented within a mentally unstable form, which has caused most English-speaking people to believe that all things connected to Confucius must also be similarly violent and incoherent. One of the core concepts within Confucian quotes is the mention of 'junzi', a 'quality man'. The Confucius quotes clearly and repeatedly speak of junzi's good inner qualities, and the concept of a junzi can then be correlated to all surrounding sentences and books. By retaining thought of a junzi's good inner qualities, the surrounding texts can then be translated to retain harmony with the idea of good, creative, inner qualities. Common English translations choose words and phrases that relate to modern English-speaking cultures, which fully destroys the heart, meaning, and patterns of the Chinese language. English is English, English is not Chinese, and the Chinese language is not the English language. It is unfair and damaging to the ancient Chinese texts to interpret the words within modern English (and modern Chinese) phrases that can only be applicable to modern English-speaking and modern Chinese-speaking people. The Li Ren Chi Dao translation strives to retain the original Chinese concepts and patterns, thereby enabling a better communication of what the ancient texts pointed to. The first advantage is that the violent and negative English words are no longer used because the violent words  do not relate to junzi qualities, and,  the violent words do not relate to any form of mental stability. The second advantage is that the translated sentences no longer contradict each other like what is predominate throughout all common English translations. The Chi Dao translation is coherent, all words agree with the others, and have no contradictions. The absence of contradictions is not forced, but rather the contradictions disappear on their own when the sentences' topics are permitted to speak of what was originally written. The third advantage is that the book's ancient message shines as reasonable, logical, mindful, intelligent, and quite pleasing to read. Several other advantages exist as well. The 里仁齊道 Li Ren Chi Dao translation will not be made available in digital form. Individuals interested in the book can email for more information.